It's that time! I am FINALLY getting around to building my website! It's long overdue and it means I'll be absent for a while, but I think it will be time well spent, since my blog is more of an interactive playground for a mixture of all sorts rather than an area for people to see or buy my more refined artwork. I will also be giving my blog a huge revamp. But the BEST news of all, is that this coming winter I will be in a position where I can increase my painting time significantly and indefinitely. This will make a huge difference to my productivity. I am so exited about this because I have another bear series in mind along with so many other ideas! Anyway - for now I will leave you with one of what will be a series of three paintings, collectively titled 'Fruit Cocktail', which is a rather more obvious title than their individual ones. Not an apple looks great. I think most of my work is what you call distance paintings! Looking forward to seeing your blog update and I must Google that website you told me about. I might want to pick your brains on how that will be better re SEO etc. I thinkis agood ideato havea separate website but i don't think it's a bad thing that your blog reflects you though-that's what keeps people coming back to read them! Not an apple ..LOL !. 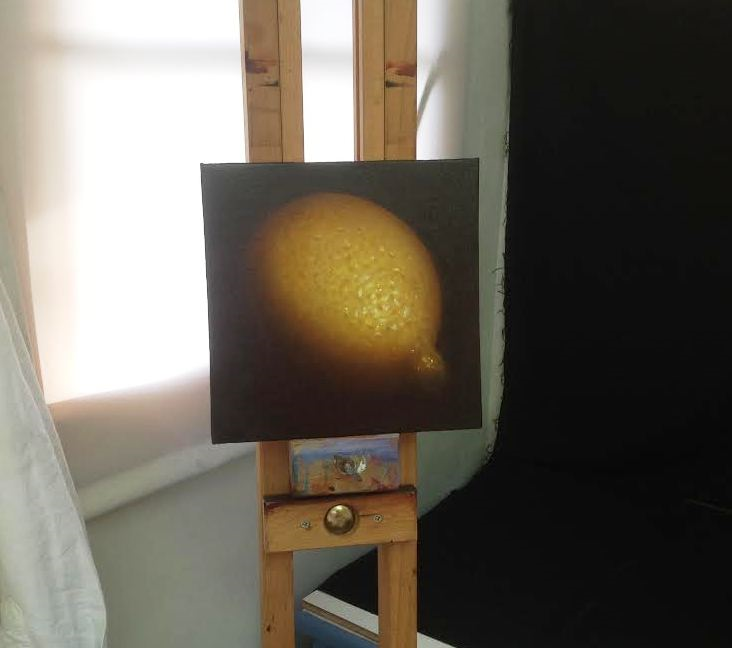 It's a great rendition of a lemon. Good luck with the website, I'm sure it will be fantastic... You don't have to say a thing.. Just put up all those wonderful paintings of yours.. I've been "out" for a bit and just caught up on your grandbaby news - Congratulations!! What fun that will be :). Your paintings look wonderful (of course) and I am excited to read about your website. I know it's not nearly as enjoyable as painting but it will be nice to have that behind you. Best of luck with that. Cheers, Sandy. Love the title and the painting! And so excited for you to hear about the increased time you will have for painting! How wonderful is that?! Especially with so many teddy bears out there waiting to be painted by you! I am happy for you, Sandra! un vero limone con il suo fascino di forma, colore che appaga gli occhi.